In March, Stanford University Libraries hosted Personal Digital Archiving 2017, a conference about preservation and access of digital stuff for individuals and for aggregations of individuals. Presenters included librarians, data scientists, academics, data hobbyists, researchers, humanitarian citizens and more. PDA 2017 differed from previous PDA conferences though, when an honest, intense discussion erupted about race, privilege and bias. Topics did not fall into neat categories. Some people collected data, some processed it, some managed it, some analyzed it. But often the presenters’ interests overlapped. Here are just some of the presentations, grouped by loosely related themes. Joan Jeffri’s (Research Center for Arts & Culture/The Actors Fund) project archives the legacy of older performing artists. Jessica Moran (National Library of New Zealand) talked about the digital archives of a contemporary New Zealand composer and Shu-Wen Lin (NYU) talked about archiving an artist’s software-based installation. In separate projects, Andrea Prichett (Berkeley Copwatch), Stacy Wood and Robin Margolis (UCLA), and Ina Kelleher (UC Berkeley) talked about citizens tracking the actions of police officers and holding the police accountable. Adam Lefloic Lebel (University of Montreal) talked about archiving video games and Eric Kaltman (UC Santa Cruz) talked about the game-research tool, GISST. Robert Douglas Ferguson (McGill) examined personal financial information management among young adults. Chelsea Gunn (University of Pittsburgh) talked about the personal data that service providers collect from their users. Rachel Foss (The British Library) talked about users of born-digital archives. Dorothy Waugh and Elizabeth Russey Roke (Emory) talked about how digital archiving have evolved since Emory acquired the Salman Rushdie collection. Sarah Slade (State Library Victoria) talked about Born Digital 2016, an Australasian public-outreach program. Natalie Milbrodt (Queens Public Library) talked about helping her community archive personal artifacts and oral histories. Russell Martin (DC Public Library) talked about helping the DC community digitize their audio, video, photos and documents. And Jasmyn Castro (Smithsonian African American History Museum) talked about digitizing AV stuff for the general public. Melody Condron (University of Houston) reviewed tools for handling and archiving social media and Wendy Hagenmaier (Georgia Tech) introduced several custom-built resources for preservation and emulation. Sudheendra Hangal and Abhilasha Kumar (Ashoka University) talked about using personal email as a tool to research memory. And Stanford University Libraries demonstrated their ePADD software for appraisal, ingest, processing, discovery and delivery of email archives. Stanford also hosted a hackathon. Carly Dearborn (Purdue), talked about data analysis and management for researchers. Leisa Gibbons (Kent State) analyzed interactions between YouTube and its users. and Nancy Van House (UC Berkeley) and Smiljana Antonijevic Ubois (Penn State) talked about digital scholarly workflow. Gary Wolf (Quantified Self) talked about himself. Some presentations addressed cultural sensitivity and awareness. Barbara Jenkins (University of Oregon) discussed a collaborative digital project in Afghanistan. Kim Christen (Washington State) demonstrated Mukurtu, built with indigenous communities, and Traditional Knowledge Labels, a metadata tool for adding local cultural protocols. Katrina Vandeven (University of Denver) talked about a transformative insight she had during a Women’s March project, where she suddenly became aware of the bias and “privileged understanding” she brought to it. The conference ended with observations from a group of panelists who have been involved with the PDA conferences since the beginning: Cathy Marshall, Howard Besser (New York University), Jeff Ubois (MacArthur Foundation), Cliff Lynch (Coalition for Networked Information) and me. Lynch agreed about automated backup. “There used to be a view that catastrophic data loss was part of life and you’d just lose your stuff and start over,” Lynch said. “It was cleansing and terrifying at the same time.” He said the possibility of data loss is still real but less urgent. I noted that the first PDA conference included presentations about personal medical records and about genealogy, but those two areas haven’t been covered since. Lynch made a similar statement about how genealogy “…richly deserves a bit more exploration.” I also noted that the general public still needs expert information about digitizing and digital preservation, and we see more examples of university and public librarians taking the initiative to help their communities with PDA. In a Q&A session, Charles Ransom (University of Michigan), raised the bias issue again when he said, “I was wondering…how privilege plays a part in all of this. Look at the audience and it’s clear that it does,” referring to the overwhelmingly white audience. Audience members suggested having the PDA host invite more local community organizations, so travel and lodging won’t matter, and possibly waiving fees. The University of Houston will host PDA 2018; Melody Condron said UH has a close relationship with Houston community organizations and she will explore ways to involve them in the conference. The conference videos are available online at https://archive.org/details/pda2017. The work of archivists is highly collaborative in nature. While the need for and benefits of collaboration are widely recognized, the practice of collaboration can be, well, complicated. This year’s ARCHIVES 2017 program featured a number of sessions on collaboration: archivists collaborating with users, Indigenous communities, secondary school teachers, etc. We would like to continue that conversation in a series of posts that cover the practical issues that arise when collaborating with others outside of the archival profession at any stage of the archival enterprise. Give us your stories about working with technologists, videogame enthusiasts, artists, musicians, activists, or anyone else with whom you find yourself collaborating! We encourage visual representations: Posts can include or largely consist of comics, flowcharts, a series of memes, etc! Posts for this series will start in November, so let us know if you are interested in contributing by sending an email to ers.mailer.blog@gmail.com! This is the fourth post in the bloggERS series on Archiving Digital Communication. This summer I had the pleasure of accessioning a large digital collection from a retiring staff member. Due to their longevity with the institution, the creator had amassed an extensive digital record. In addition to their desktop files, the archive collected an archival Outlook .pst file of 15.8 GB! This was my first time working with emails. This was also the first time some of the tools discussed below were used in the workflow at my institution. As a newcomer to the digital archiving community, I would like to share this case study and my first impressions on the tools I used in this acquisition. Convert the .pst file into an .mbox file. Place both files in a folder titled Emails and add this folder to the acquisition folder that contains the Desktop files folder. This way the digital records can be accessioned as one unit. Follow and complete our accessioning procedures. Things were moving smoothly; I was able to use Emailchemy, a tool that converts email from closed, proprietary file formats, such as .pst files used by Outlook, to standard, portable formats that any application can use, such as .mbox files, which can be read using Thunderbird, Mozilla’s open source email client. I used a Windows laptop that had Outlook and Thunderbird installed to complete this task. I had no issues with Emailchemy, the instructions in the owner’s manual were clear, and the process was easy. Next, I uploaded the Email folder, which contained the .pst and .mbox files, to the acquisition external hard drive and began processing with BitCurator. The machine I used to accession is a FRED, a powerful forensic recovery tool used by law enforcement and some archivists. Our FRED runs BitCurator, which is a Linux environment. This is an important fact to remember because .pst files will not open on a Linux machine. At Princeton, we use Bulk Extractor to check for Personally Identifiable Information (PII) and credit card numbers. This is step 6 in our workflow and this is where I ran into some issues. 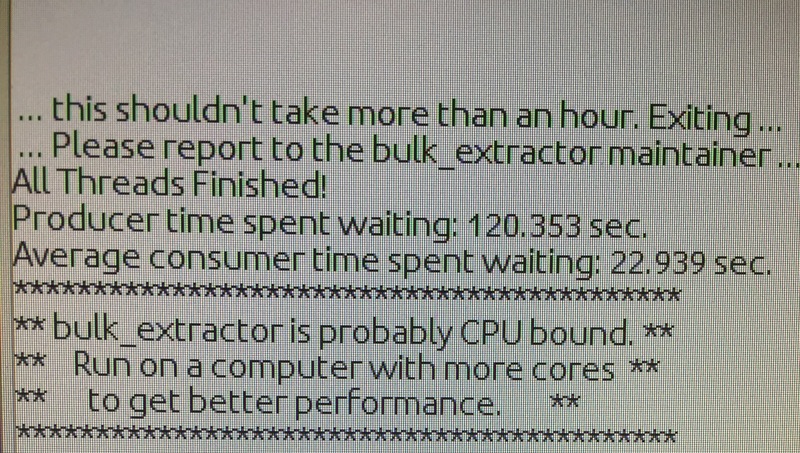 Yeah Bulk Extractor I’ll just pick up more cores during lunch. The program was unable to complete 4 threads within the Email folder and timed out. The picture above is part of the explanation message I received. In my understanding and research, aka Google because I did not understand the message, the program was unable to completely execute the task with the amount of processing power available. So the message is essentially saying “I don’t know why this is taking so long. It’s you not me. You need a better computer.” From the initial scan results, I was able to remove PII from the Desktop folder. So instead of running the scan on the entire acquisition folder, I ran the scan solely on the Email folder and the scan still timed out. Despite the incomplete scan, I moved on with the results I had. Even though Bulk Extractor Viewer does display the content, it displays it like a text editor, e.g. Notepad, with all the coding alongside the content of the message, not as an email, because all the results were from the .mbox file. This is just the format .mbox generates without an email client. This coding can be difficult to interpret without an email client to translate the material into a human readable format. This output makes it hard to locate an individual message within a .pst because it is hard but not impossible to find the date or title of the email amongst the coding. But this was my first time encountering results like this and it freaked me out a bit. Because regular expressions, the search method used by Bulk Extractor, looks for number patterns, some of the hits were false positives, number strings that matched the pattern of SSN or credit card numbers. So in lieu of social security numbers, I found the results were FedEx tracking numbers or mistyped phone numbers, though to be fair mistyped numbers are someone’s SSN. For credit card numbers, the program picked up email coding and non-financially related number patterns. The scan found a SSN I had to remove from the .pst and the .mbox. Remember .pst files only work with Microsoft Outlook. At this point in processing, I was on a Linux machine and could not open the .pst so I focused on the .mbox. Using the flagged terms, I thought maybe I could use a keyword search within the .mbox to locate and remove the flagged material because you can open .mbox files using a text editor. Remember when I said the .pst was over 15 GB? Well the .mbox was just as large and this caused the text editor to stall and eventually give up opening the file. Despite these challenges, I remained steadfast and found UltraEdit, a large text file editor. This whole process took a couple of days and in the end the results from Bulk Extractor’s search indicated the email files contained one SSN and no credit card numbers. While discussing my difficulties with my supervisor, she suggested trying FileLocator Pro, a scanner like Bulk Extractor that was created with .pst files in mind, to fulfill our due diligence to look for sensitive information since the Bulk Extractor scan timed out before finishing. Though FileLocator Pro operates on Windows so, unfortunately, we couldn’t do the scan on the FRED, FileLocator Pro was able to catch real SSNs hidden in attachments that did not appear in the Bulk Extractor results. I was able to view the email with the flagged content highlighted within FileLocator Pro like Bulk Extractor. Also, there is the option to open the attachments or emails in their respective programs. So a .pdf file opened in Adobe and the email messages opened in Outlook. Even though I had false positives with FileLocator Pro, verifying the content was easy. It didn’t perform as well searching for credit card numbers; I had some error messages stating that some attached files contained no readable text or that FileLocator Pro had to use a raw data search instead of the primary method. These errors were limited to attachments with .gif, .doc, .pdf, and .xls extensions. But overall it was a shorter and better experience working with FileLocator Pro, at least when it comes to email files. As emails continue to dominate how we communicate at work and in our personal lives, archivists and electronic records managers can expect to process even larger files, despite how long an individual stays at an institution. Larger files can make the hunt for PII and other sensitive data feel like searching for a needle in a haystack, especially when our scanners are unable to flag individual emails, attachments, or even complete a scan. There’s no such thing as a perfect program; I like Bulk Extractor for non-email files, and I have concerns with FileLocator Pro. However, technology continues to improve and with forums like this blog we can learn from one another. 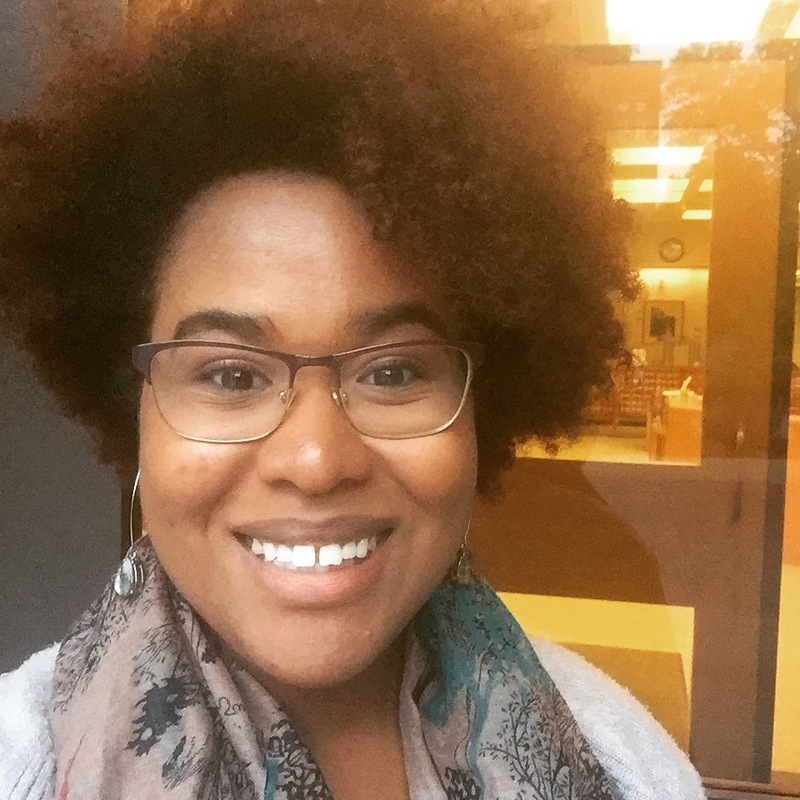 Valencia Johnson is the Digital Accessioning Assistant for the Seeley G. Mudd Manuscript Library at Princeton University. She is a certified archivist with an MA in Museum Studies from Baylor University. This is the third post in the bloggERS series on Archiving Digital Communication. The predictions have come true: acquisitions of born-digital materials are on the rise, and for the foreseeable future many of these collections will include a combination of digital and analog materials. Working with donors prior to acquisition can help a collecting body ensure that the digital archives it receives fall within its collecting scope in terms of both format and content. This holds true for institutional repositories, collecting institutions of all sorts, and archives gathered and stored by communities and individuals rather than institutions. Donors sometimes can provide insight into how born-digital items in an acquisition relate to each other and to non-digital materials, which can be particularly helpful with acquisitions containing a hybrid of paper and born-digital correspondence. I’ve helped transfer a few acquisitions containing different kinds of digital correspondence: word processing documents, email on hard drives and in the cloud, emails saved as PDFs, email mailboxes in archived formats, and others. Often the different formats represent an evolution in a person’s correspondence practices over time and across the adoption of different digital technologies. Just as often, a subset of these different types of digital correspondence are duplicated in analog form. Letters originally written in word processing software that also exist as print-outs with corrections and scribbles, not to mention the paper copy received (and perhaps retained in some other archive) by the recipient. Email that has been downloaded, saved, printed, and stored alongside analog letters. An acquisition that includes email as the only correspondence after a particular date, all of which is downloaded and saved as individual PDF files, but only the most important ones are printed and stored among paper records. Email folders received annually from staff with significant duplication in content. Tens of thousands of emails stored in the cloud which have been migrated across different clients/hosts over the last 20 years, some with different foldering and labeling practices. When the time comes to transfer all or some of this to an archives, the donor and the collecting body must make decisions about what, if anything, is important to include and how to represent the relationship between the different correspondence formats. Involvement with donors early on can be incredibly beneficial, but it can also cause a significant drain on staff resources, particularly in one-person shops. What is the minimum level of support staff can provide to every donor with digital materials? What are levels of service that could be added in particular circumstances—for example, when a collection is of particular value or a donor requires additional technological support? And how can staff ensure that the minimum level of service provided doesn’t inadvertently place an undue burden on a donor—for example, someone who may not have the resources to hire technological support or might not like to ask for help—that results in important materials being excluded from the historical record? At the staff end, hybrid correspondence files also raise questions about whether and how to identify both paper and digital duplicates (is it worth the effort? ), whether and how to dispose of them (is it worth the time and documentation? ), and at what point in the process this work can realistically take place. Many of the individual components of hybrid correspondence archives seem familiar and perhaps even basic to archivists, but once assembled they present challenges that resemble a more complex monster—one that perhaps not even the creator can explain. I’m writing from the perspective of someone who has been involved with hybrid collections primarily at the acquisition and accessioning end of the spectrum. If any readers have an example of an archival collection in which the hybrid nature of the materials has been helpful (like a Spork! ), perhaps during arrangement & description or even to a researcher, please share your experience in the comments. Gabby Redwine is Digital Archivist at the Beinecke Rare Book & Manuscript Library at Yale.